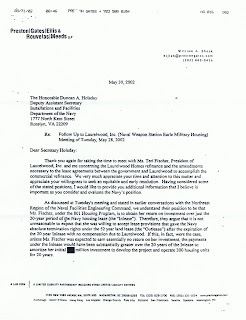 Through the Freedom of Information Act, NOPE obtained a May 30, 2002 letter from William Shook, attorney for Laurelwood Homes, LLC owner Teri Fischer to Department of Navy official Duncan Holaday, explaining why the Navy needed to sign away (which it ultimately did, without telling the public)its contractual right to revoke the 52-year Laurelwood privatized housing contract in order for Ms. Fischer to refinance her loan through a commercial lender. There are a few morals here: 1) the DoN not only put the U.S. in danger (i.e. exposure to terror attacks on NWS Earle now that there will be unimpeded access to the Laurelwood development) by signing away a vital contract revocation clause, for no good reason other than to give one of its private housing contractors a sweetheart deal, and 2) during a face-to-face 2008 meeting with high-ranking DoN officials, lied to a U.S. Congressman (Chris Smith) and the public (NOPE representatives) - much as it did in its Laurelwood impact statement (EIS) -- about its motivations for going thru with the civilian-rental phase of the 52-year lease. For those not close to our case since 2008, NOPE has objected from the get-go to a DoN plan to open NWS Earle to civilian housing, for numerous security, financial and environmental reasons, arguing the Navy should either by revoking the contract or buying it out. 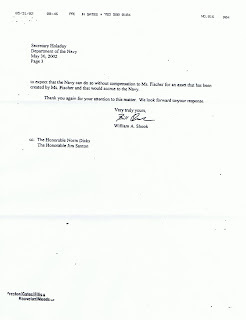 The Navy never told anyone it had signed away the revocation clause; NOPE found out when we obtained the lease agreement thru the Freedom of Information Act. Rather, it said the government could not afford to get out of the housing deal and did not want to be a bad business partner to military contractors. That leaves the Navy with only the buyout option, and considering the silence from DoN leadership in Washington, NOPE can only suspect that the Navy is going through with its civilian rental phase of the Laurelwood lease. Citing the latest FOIA discovery, however, perhaps it is time for our federal legislators to call for a wider investigation of this matter, considering the thinking process (or obvious lack thereof) behind the Laurelwood housing contract mess, and to follow the money trail. NOPE invites you to read the attached 3-page letter and share your thoughts with us.